As efforts are underway to commence the development of a new and permanent ferry terminal in West End, Premier and District One Representative, Hon. Andrew Fahie anticipates that there will be issues in relation to the private lands in the vicinity of the terminal. This is due largely to the fact that the available space is very small in comparison to the conceptual designs recently made public, and the need for more space to provide for certain facilities such as parking. Director of Planning at the Recovery and Development Agency—which is responsible for overseeing the development— Mr. Neil Smith recently told residents of West End and other stakeholders that based on the statement of requirements for the project, some 27,600 square foot would be needed. This, however, raised some concerns, as residents pointed out that if more space will be needed, then the private lands surrounding the ferry terminal may have to be encroached on. “Does Government have access to the land in the vicinity of the West End port?” one man questioned. Responding to such concerns, Premier Fahie—who has long been pushing for the development of a larger and permanent ferry terminal in West End—said, “Land issue is going to be a problem,” adding that he is not afraid to speak about the reality of the issues that will come with the project. “And to get that solved, it won’t be solved overnight because according to the law, there’s a long process even if you want to compulsory acquire,” he added. He noted that when it comes to land in this country, it is not quite simple. Even prior to taking office, Hon. Fahie has been an advocate for the development of the West End Ferry Terminal—even before the old facility was destroyed by the 2017 storms. 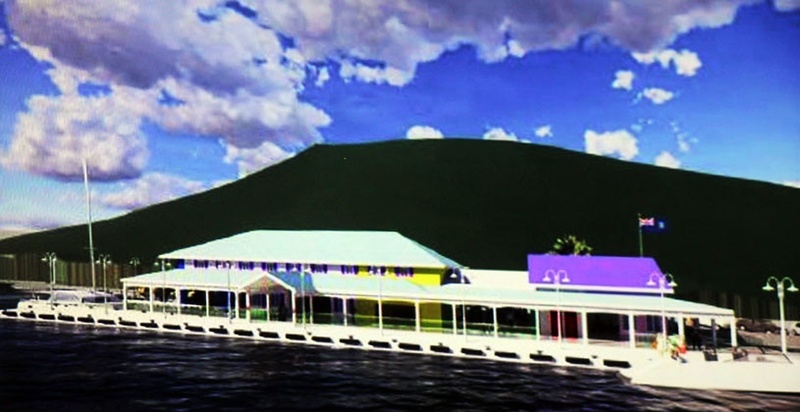 Prior to the former National Democratic Party (NDP) Government taking office, the previous Virgin Islands Party (VIP) administration had plans for a $43M facility. However, this budget was later slashed by the NDP to a mere $3 million. After the hurricane, the need became even more evident as Hon. Fahie, who was Opposition Leader at the time, complained of the suffering that resulted from the closure of ferry services in West End. Over the years, Hon. Fahie continued to stress on the need for the facility and since taking office as Premier, he said it is one of his priority projects. Recently, he announced that a private donor is willing to fund over 50 percent of the cost of establishing a permanent ferry terminal, one that can facilitate 200,000 passengers and 20,000 vessels per year, and increase income. The best place by far given the statement of requirements will be to relocate the terminal close to west end police station, plenty of parking, adequate space for taxis to operate, cargo storage, support businesses catering to tourists. Why not put it back by the Police station or where passers used to be? Well if you cannot build on the land then your only options are to infill what you need or move the location entirely to a more hospitable location in West End. Why not look at all the infill Andrew and Co. are doing just around from Frenchman's Cay along the water.